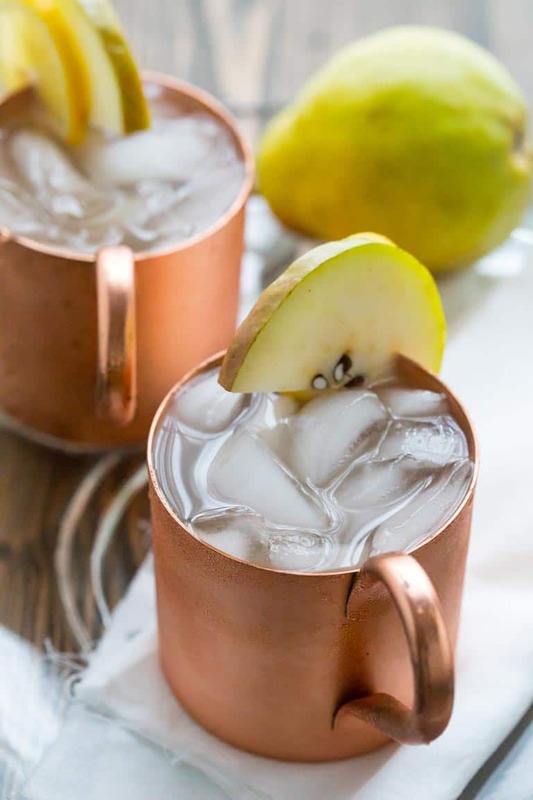 These Vanilla Pear Moscow Mules are super simple to stir together, and are a fun and festive cocktail for the holidays! Plus I have a handy cocktail calculator that will help you figure out how many drinks to plan to serve for your party. Silly me. I had no idea that my kids had the entire week off next week. Face palm! Seriously, on Tuesday (this week) I was reading through my emails, and our dance instructor reminded us there was no school next week and therefore no ballet for my daughter. I read it two times! “No school next week?” What is she talking about? Then went on to the school calendar to confirm. Indeed the kids don’t have school at all next week and I had been thinking they had it on Monday and Tuesday! Good thing my job is flexible! 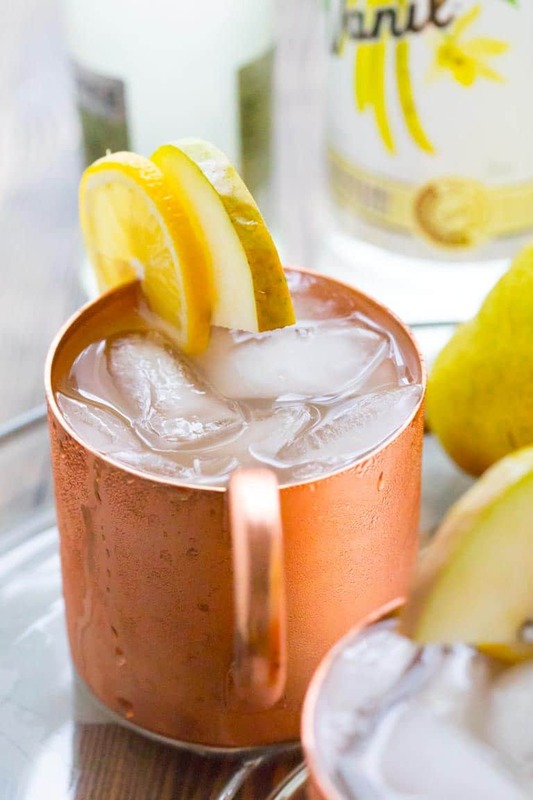 And good things for these Vanilla Pear Moscow Mules! They are just what this Mamma ordered after this week- and heading into a holiday week with the kiddos home with me next week. They are super simple to make- the hardest part is squeezing the lemon, and I think we can all handle squeezing a lemon. I know you’re wondering about the pear juice so let’s talk about that really quickly. The first time I had pear juice was when I was in Italy for my Junior year in college. My friend Abby turned me on to it. Succo Di Pera in Italian. It is so velvety and thick-the label says 2 grams fiber- so there is more fruit solids than another clear juice like apple juice. The texture is more akin to a very light smoothie rather than juice. And the taste is the essence of pear. Lovely! You can find pear juice with the other natural juices at good supermarkets, Whole Foods, Trader Joes etc. 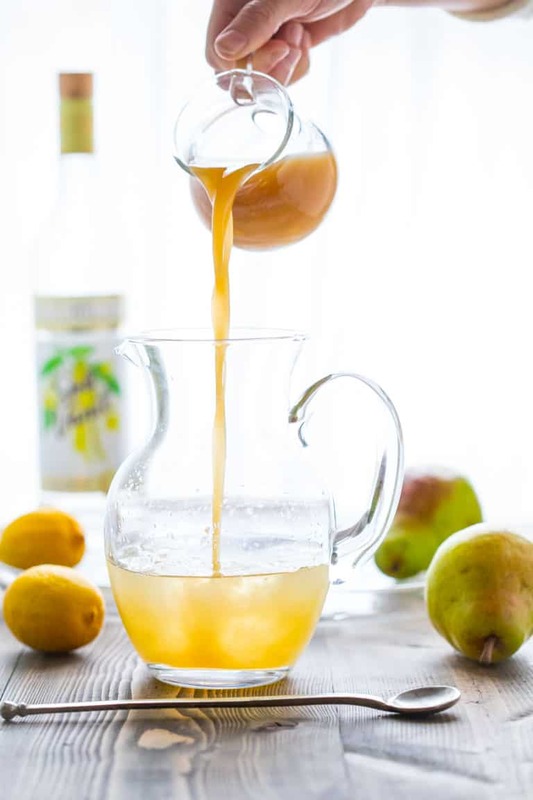 For this recipe, I used this pear nectar from Santa Cruz but I also love the pear juice from Ceres. 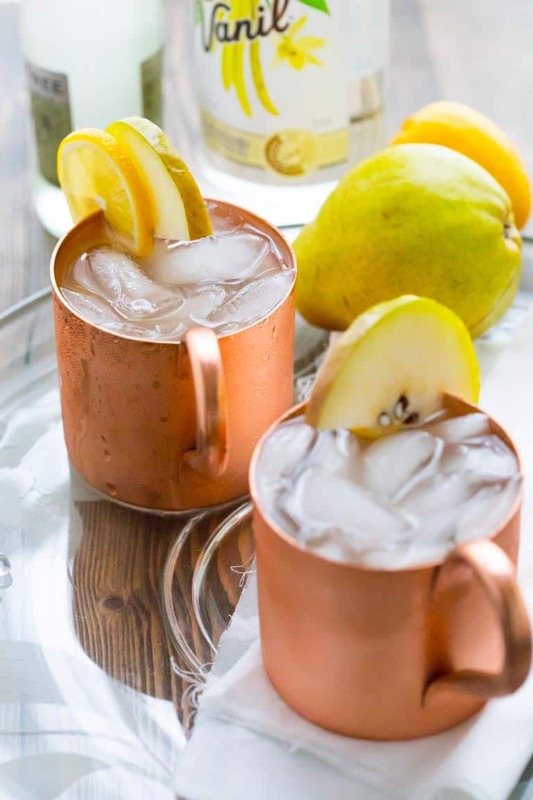 Pear and vanilla are a classic combo, as are pear and ginger, so the trio of them together is really something delicious here in these Moscow Mules! 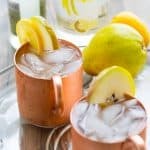 If you are planning to serve these Vanilla Pear Moscow Mules this Thanksgiving or for a Holiday Cocktail Party, Here are some are some basic guidelines for planning the number of drinks to serve. Adjust up or down depending on the weather, age of guests, time of day, and amount of food being served. You can get more cocktail tips here, and a super quick holiday appetizer. 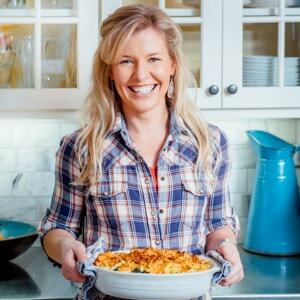 As we officially head into the holidays today, I wanted to let you know that I am here if you need me with any Thanksgiving or Holiday Entertaining questions. 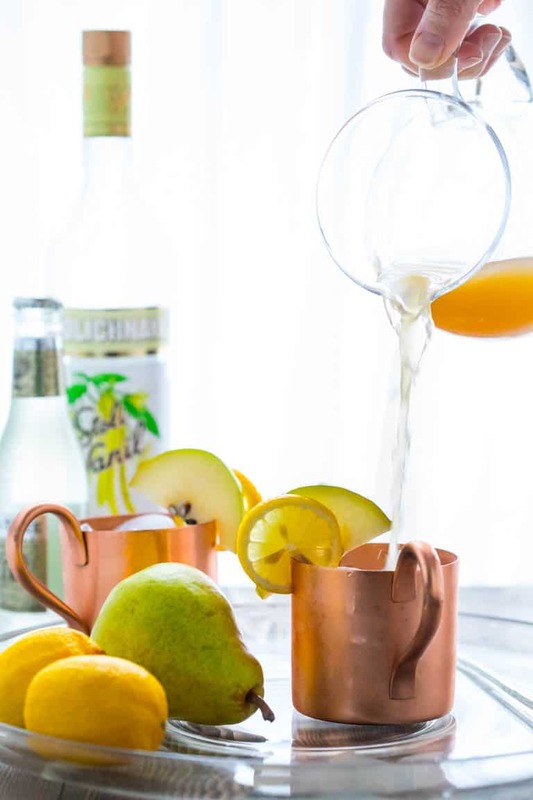 These Vanilla Pear Moscow Mules combine the flavos of ginger, vanilla and pear in a fun and festive cocktail for Thanksgiving, Christmas and more! Combine vodka, pear juice or nectar, ginger beer and lemon juice in a pitcher. Stir to combine. Divide ice among 4 mugs, preferably copper. Divide pear mixture among the mugs. Garnish with pear and lemon if desired. Mmmm, I love a good Moscow Mule! 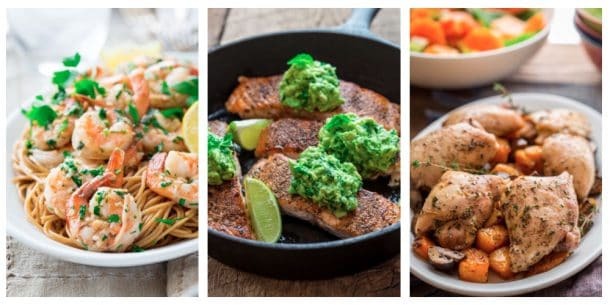 What a delicious twist on the flavors! Thanks so much Colleen. Hope you have a great week! lol @ “no school”? life with kids gets so busy sometimes we can’t see the forest for the trees. Every mother has been there! That’s when it’s important to slow down and relax. This drink is exactly what the doctor ordered for relaxing! I just told my neighbor that I had been unaware of this and he pointed out that they have always had the M and T off–> I just spaced it this year! Ha ha. Even sillier of a mistake in that case. Lol. Thanks so much for coming by and I hope you have a relaxing holiday as well. Cheers! Thank you so much Deanna. Have a great day. This is making me feel like grabbing one moscow mule. Glad to hear they are appealing to you! Have a good one! What a great idea! I love the concept of using lighter flavors in a mule. So perfect for the holidays! The vanilla and pear go so well with the traditional ginger. We love it! These photos are so lovely- the one of you pouring totally caught my eye on Instagram this morning! This cocktail is perfect for Thanksgiving. Thanks so much for saying so. I was worried nobody saw that post, since it didn’t seem to have the usual reach. Which always makes me sad when I am particularly fond of a recipe. Which is certainly the case with these cocktails. Ha ha. 🙂 Anyway, thanks so much for coming by to check them out. Have a great day.